"Chewie, our golden MOODLE came into our lives eight years ago. He arrived via airfreight from Country Puppies in Bathurst. He was a bundle of fluff when we first saw him and we could really see his eyes through all the hair, so my son named him Chubacka. As he settled into Melbourne life and his new home, he discovered his love for chewing, especially any unsuspecting socks left lying about. So his name was shortened to Chewie. 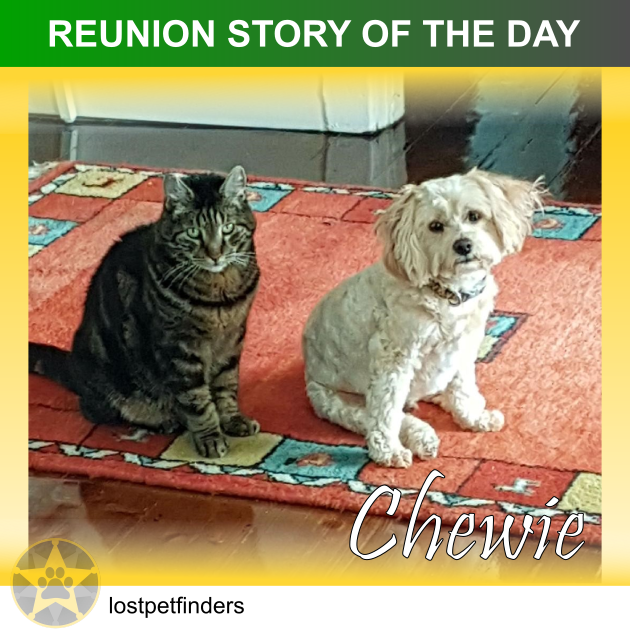 Chewie is at the heart of our family, along with our cat Lucky, who is Chewie’s best friend, and often comes on family holidays never far from under our feet. On our evening walks both Chewie and Lucky come together. For the last couple of weeks, I have been staying at my sister’s house looking after my elderly mother. Naturally, Chewie came with me and until yesterday he had been enjoying his new environs and new neighbourhood smells. Yesterday, while I was at the hospital with mum Chewie, managed to find an escape from the backyard and when I came home excited to see him he was nowhere to be seen. Initially, I couldn’t believe he had gotten out. I walked around the neighbourhood calling him for an hour or so and then further afield in the car but to no avail. I spoke to neighbours and the Postman who recalled seeing him out on the street that morning but nothing. At some stage, I had a cry. Not knowing where to start I simply googled ”find my pet” and came across Lost Pet Finders. I thought it could be just another online rort but being desperate I signed up, paid for a Pet Alert and logged Chewie’s details. I found the site very helpful as it went through a checklist of what to do. I promptly got an email back welcoming me to the service informing me there were 142 people within a 1.8 km radius who were registered with their service so I was hopeful. I rang the local Vets, Lost Dogs Home etc but nothing. I made up some cute flyers and blitzed the neighbourhood by that time it was dark so I decided to retire for the evening. Later in the evening one of my sons rang me from home to let me know someone from the Glen Eira Council had left a message telling us that Chewie had been found. First thing this morning I jumped in the car and was off to the Council Offices who informed me he had been taken to the RSPCA. Two hours later Chewie was back in my arms as gorgeous as ever. When I got back to my sister’s I had 8 messages from LostPetFinders. 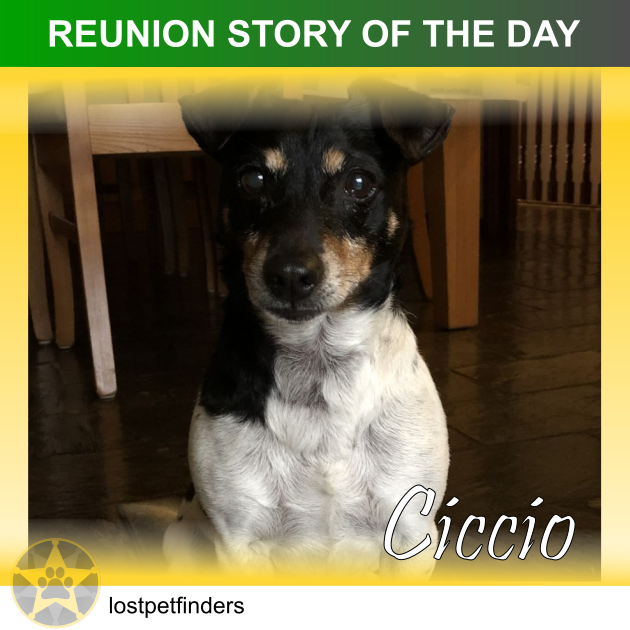 One was from an angel called Elizabeth who wrote saying she had found Chewie on the way home and taken him to the nearest VET. "The best piece of advice I can give is to be extremely active in searching for your lost pet. Definitely, do NOT sit at home and wait for a phone call. Multiple posts on Facebook and other platforms of social media help. There are usually gardeners, property maintenance people and rangers in areas near new suburbs so make sure the owners of the lost pets go around and email/text photos of their lost pet and their contact details. As well as this, contact Blacktown and Hawkesbury pounds and ensure they haven’t yet received your dog. I think these are the only pounds in Sydney. And of course, use Lost Pet Finders. I extremely loved your services because you made me feel supported throughout this whole process which calmed me down. When calm, people can think clearer. But if the organisation was rude and very distant with their assistance, I would’ve stressed out more and probably would’ve given up hope. "Thank you once again. It was such a good feeling to have my Max back and for this I thank each an everyone who took their time to post and share on Facebook. I can’t believe there are still such kind human beings on this earth. 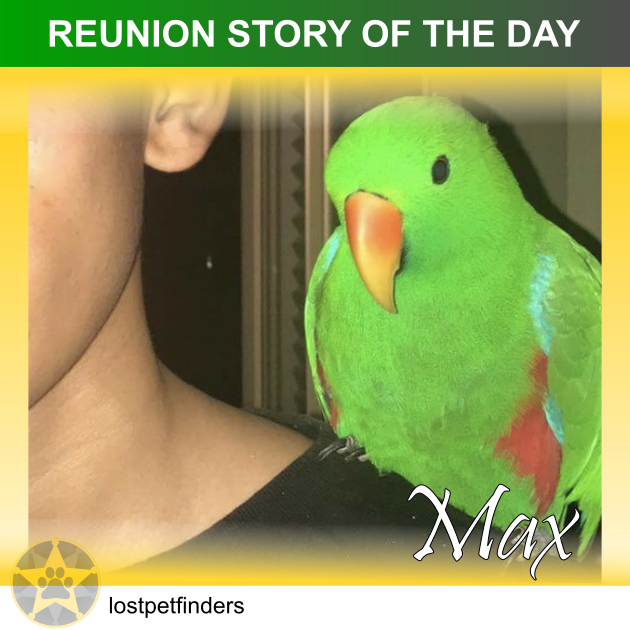 I got to know about Max as one lady inform me about the post on Facebook regarding she handed my lost bird to the lady from where I got my max as she too lost her bird and she thought Max was her bird. When she found out that it was not her bird she posted on Facebook again that she found the bird. After that everyone whoever seen that post started sending messages to me. Even Kellyville pets send me the link and I found this lady with whom my bird was in her care. I contact her from Las Vegas as I was on holiday but she was kind to respond us but we had a hard time to convince her that it is our bird. The strange thing was that she already gave this bird to someone who claimed my bird as her. After giving her evidence she finally agreed with us and took our bird from the one who took it from her and rest is the history. When we lose my bird my family was so upset as he has been with us for three years and we are so used with him. The day he flew away I put him outside the cage in the evening but after some time he was missing. We found his missing after we checked our CCTV camera. As soon as he flew away I posted on Facebook and on many websites but I did not get any response from anyone. 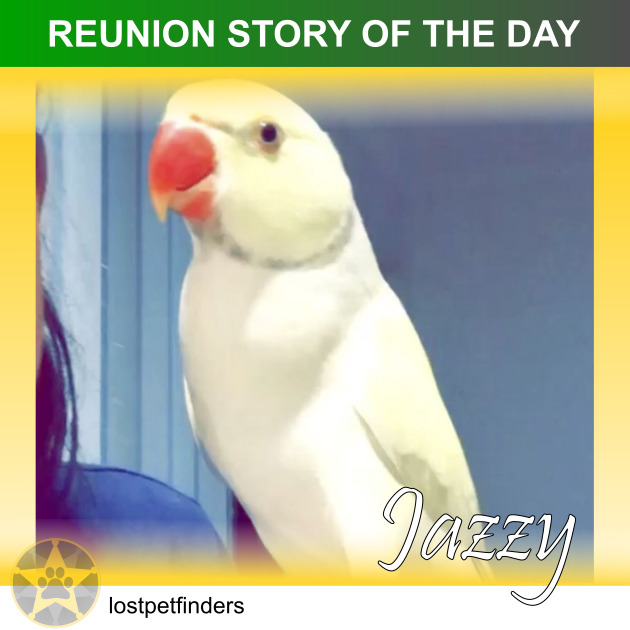 After that, I went to the USA on holiday but my bird’s memory was still haunting me so on holiday I registered on your website that is Lostpetfinders and after that, within few days I found my Bird. "A lady called me on saturday after seeing one of my good old fashioned poster. The lady did not use social media and had no idea who to call so waited for someone to come knocking. It was only luck with that she drove a different way to work that day and saw it on a street corner. When i walked in and called jazzy he almost screamed kept calling out... we both got quite teary as jazzy obviously knew who i was. He was so happy to be home that night and teko his buddy was glad to see him too! "I adopted Sophie probably about 4 years ago. As she is an adopted cat, we guessed her age now to be about 7-8 years old. Sophie is an indoor cat only. So she’s not equipped to be outside. Anyway, I came home from work tonight, and couldn’t find her. She would normally greet me at the front door but she wasn’t there. I looked for her everywhere around the house, and couldn’t find her. She must have slipped out the door when I left for work this morning. I left around 7am and by the time I get home at 5pm, she would have been outside by herself for a good 10 hours. I panicked. I called rspca, called local vets, called the council, register her as a missing pet to several different organisations including LPF. 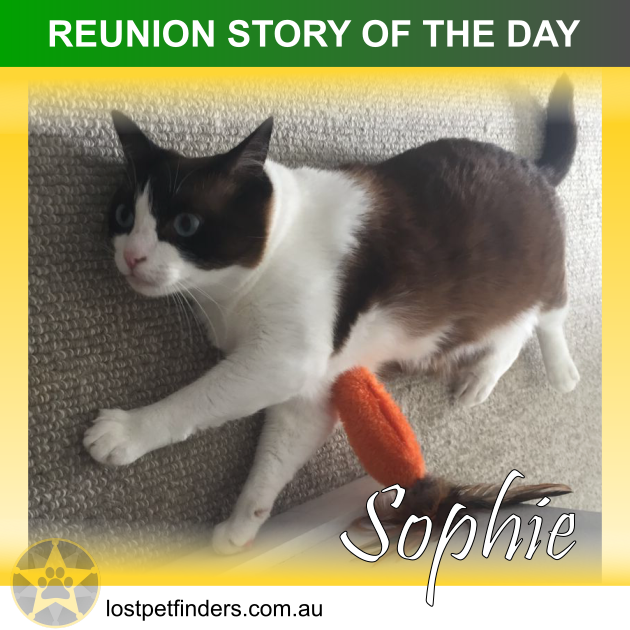 I did get a call from the council about an hour later, and said there’s a cat nearing Sophie’s description found about a suburb away. I spoke to the lady over the phone, and she tried to keep the cat there for me. I drove there, but the cat had gone away again. But the lady was very nice, she talked to her neighbours even to people jogging down the street and asked if they’ve seen a cat. I eventually found the cat, but unfortunately it wasn’t Sophie. The cat was a local neighbours’ cat. I went back home and walked around my area for a good 2 hours. I had her food bowl and was shaking it, calling out her name, stopping and listening carefully if I could hear her meow. I had her used litter box stationed outside the front door of my house, in case she tried to find her way back home. And luckily, my friend came over with a great big white torch, and we found her VERY WELL HIDDEN amongst the bushes. I was standing there already with my iPhone torch for a few minutes and I couldn’t see her at all! But my friend with his big white torch was able to see her. She’s now home safe and sound. I would like to say thank you to LPF. Even though I didn’t find her through LPF but I must say the service was excellent. I get emails straight away, and my post was up straight away. At least alleviating my anxiety a little bit, knowing that I’m doing something and someone could literally be with her as we speak and saw the post. If I can share my experience and what I’ve learned from it...typical cat (especially females) usually doesn’t wonder too far from home. A nice big white torch really does help and never underestimate how well a cat can hide. So when you look around the bushes, or up the tree, make sure you really really look. And it’s better to look when it’s quiet. After traffic had died down, as you can hear the cat better and there’s a better chance the cat won’t be too scared to come out of hiding.